I’ve created a monster. Let me explain. When I first joined French Fridays with Dorie, oh, almost exactly 3 years ago now, I remember discussing the idea with my husband first. I’m not sure that he fully understood the concept of an online cooking group, but once he learned that it would require me to make more desserts than I normally do, he got on board with the idea and has been very supportive ever since. However, the one area which has caused a bit of pain over the years is the picture taking. How many times has the poor guy been told, “you can’t eat until I’ve taken a picture”? I’m sure that your own significant others can relate. 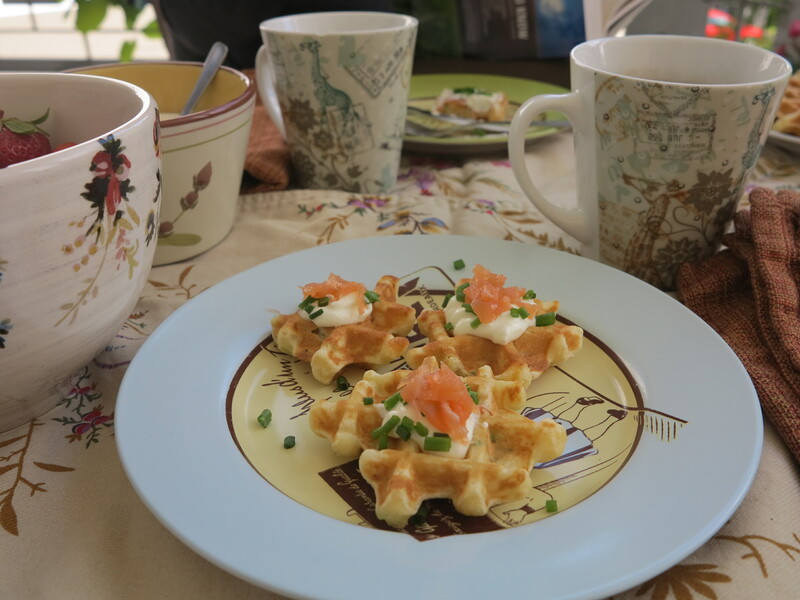 But this week’s recipe, Smoked Salmon Waffles, led to an unexpected turn of events. We made this dish last Sunday for breakfast and, considering that this was my first FFwD recipe in our new apartment, only one week post move, I considered it a major accomplishment that I was even able to find the camera and, more importantly, the waffle iron. 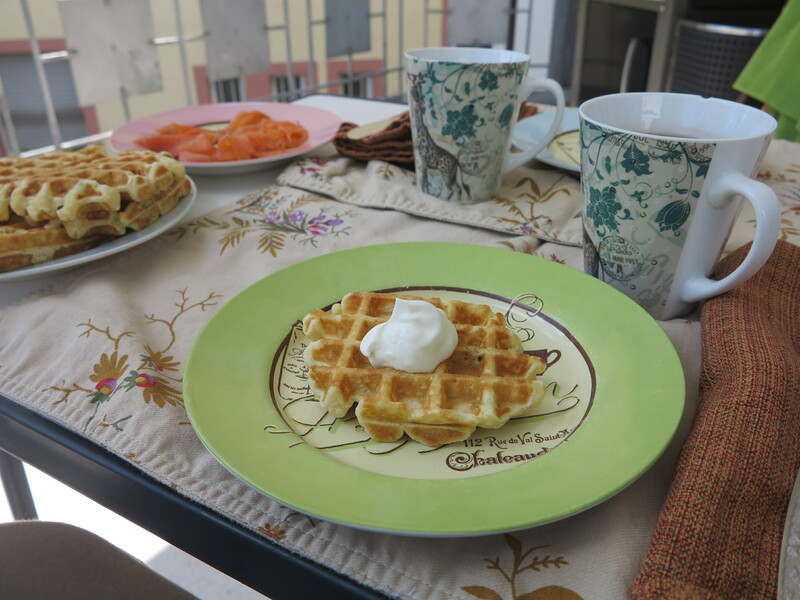 But find it I did and, skeptical though I may have been (I mean, smoked salmon IN waffles? Really? ), I dutifully set about making the dish according to Dorie’s instructions. After I’d made a few waffles and was about to unplug the waffle iron, my husband wandered in to check up on me and, apparently, was not entirely happy with what he found. the German: How’s it coming? me: I think this should be enough, we can eat. the German (looking concerned): … Are they really done? the German: But, they don’t look like the picture in the book. me: Well, they made mini versions for the book and I thought that sounded like a hassle, so I made regular sized ones. the German: And where’s the green stuff? me: Do you mean the chives which they sprinkled on top? They’re in the waffles. I didn’t chop up extra for garnish. the German (still looking concerned): Oh. me: I’m going to go eat my breakfast now. There’s still plenty of batter and chives if you want to try to replicate the picture in the book. And so my fellow Doristas, that is exactly what he did! He plugged the waffle iron back in, sliced up some extra salmon and chopped some chives. It apparently took several attempts to figure out exactly how little batter to use for the perfect mini waffles. The picture above are my waffles and the picture below are his, so that you can judge for yourself. I personally thought that he did a great job. Oh, and before I forget, looks aside, we both enjoyed these. This entry was posted in french fridays with dorie and tagged Around my French Table, breakfast, fish. Bookmark the permalink. HA! That’s awesome. He did an excellent job of replicating the picture in the book. Make that German an extra dessert! I think both of your versions look wonderful! I was sorry I didn’t have the “other” iron and so couldn’t make mini ones, but they were delicious anyway. Very impressive to get this one completed, and so beautifully, such a short time after your move! I love your story and I am going to share with my husband. Glad you both enjoyed them. LOL – I hope he thought they tasted better because tbey looked like the book. Congrats on your move and glad you liked the waffles. LOL x 2! Love your German! My DH has gotten use to ‘don’t touch until pictures are taken’ and he rather enjoy the variety of food that comes closer to the end of the week! Wow ! Your German did a wonderful job ! I ran out of patience and batter and made plain ones. But they sure were tasty. Glad you both enjoyed it too. Your mini waffles are awesome looking! This post made me laugh so much! I love how your husband has gotten completed on board with French Fridays. Those mini-waffles are adorable. He did a great job with the styling. And, your breakfast spread on the balcony looks idyllic. Your post made me smile! I’m totally impressed! I love how beautifully he garnished! Your table looks so inviting…both versions are lovely! Have a great weekend, Rose! WOW! Your husband did an excellent job! His waffles look excellent. I’m so impressed that he took the initiative to make them pretty. Love that story! My mother has become my food stylist, when I cook French Fridays dishes for them. I think she could relate to your husband’s effort. And I think you both ended up with great results. He did an amazing job! Well done to both of you! I don’t have a waffle iron but it is very high on my wishlist! When I get it I will definitely make them! One Dorista’s monster is another’s angle. Oh how I could interest my man in ANY of this. ANY. OF. THIS. Rose, I can see that your move went well – congratulations on getting everything done so quickly and posting just one week after the move. And, yes, this post is fun to read and, yes, both yours and your husband´s versions look wonderful! Have a great Wednesday (hopefully the rain will cease soon)! When I made these, Joe was harping on me for making them (and didn’t understand how they could be any good). At the end of the night, I couldn’t feed him enough of these…. Go figure!